Two Bears Farm and the Three Cubs: YOU?!? SEWING?!? In May I casually informed Paul that I'd need him to watch the boys Monday nights during the month of June. He said, "Sure, how come?" and I said, "I signed up for a beginner's sewing class." Paul didn't quite pass out in shock on the floor, but instead he said, "YOU?!? SEWING?!?" Okay, so maybe I'm not so inclined with these sorts of things. Perhaps he was remembering one of my very first blog posts, (click here to read), a sewing attempt that was almost a complete bust, and even resulted in breaking out the hard liquor. At any rate, Paul agreed to watch the boys so I could attempt a sewing class. I warned the teacher the first night that sewing gave me a temper. She just laughed and told a story about someone that threw her material across the room in a rage. The teacher then sent her home for the night. I knew right then that I'd better be on my best behavior! For my first assignment, I had to pick out something with a zipper, that used material that wasn't slippery, and a pattern that said "EASY". So I picked out a purse. I swear, sewing patterns are written in a foreign language. Because I read that thing a hundred times and I still couldn't understand it. And this was just the part about cutting out the pattern! I never would've succeeded without significant intervention from my mom and the teacher. The pockets were a nightmare, I didn't know what a gusset was, and HELLO they should not make patterns that don't fit the exact size of the zippers you can buy. Duh! Oh, and thank goodness for a seam ripper, as I ripped out five seams. For my next project I wanted something easier. I didn't want to go through all that mess again. So I decided to make a teepee for the boys. This pattern was so easy - I could understand it and although it was monotonous doing the same thing for each piece, it wasn't difficult. This time, I only had to remove one seam (sewed it on the wrong side) and I had to redo the PVC pipes because I originally drilled the holes in the short ones instead of the long pieces. But it turned out well, and is nice because it stashes under a bed. 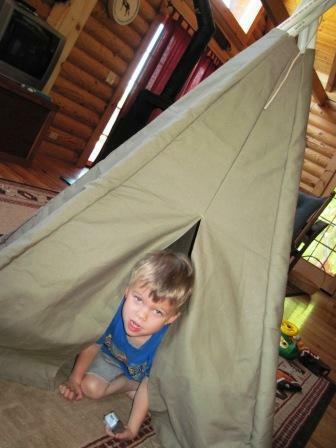 I don't want to press my luck or anything with this, but I'm tempted to buy some fabric paints and let the boys do hand prints along the sides of their teepee. Check out my giveaway for Toddler Toes from Loveable Labels HERE! I have so many projects in my head to sew, but I'm not good at it and my mom is tiring of me asking her and always tells me to take a class! That teepee is so cute! and the bag too! I comment you for trying + learning - that's the most important!! oh, good for you! love the tepee idea! what a neat project. You did GREAT on your first attempt at sewing.... Sewing is not my 'thing' either. My Mom (who was an excellent seamstress) tried everything she could to get me interested in sewing. She even bought me a sewing machine when I got married... I 'seldom' used it---only to sew up rips and hem things... Just not an interest of mine.. BUT--I'm envious of all of the work that I see others do... Oh WEll!!! Good for you! Love the teepee and handprints would be a cute design! great job! make more teepees. seriously. those are way too fun. You did a great job! Hey even people who have sewn for years can get thrown by pattern language! Trust me on this! Sewing is such a handy thing to know how to do! Good for you! What fun! My mom taught me how to sew when I was really young and I dabble in it every now and again...I love it. Can't wait to see your next project! I have a sewing machine and use it to take in and up pants. (In for the kids/ up for me) anyway, I'm now inspired to do more! I'll have to check out a class. Awesome Job!!! :-) You did great! I need to do a sewing class. Maybe I could be motivated to finish a project if I was paying someone to teach me! That purse would have made me quit completely, but I'm glad you kept on with it! Love that teepee, and I actually do like the idea of decorating the panels! Wow, those projects look great! Congrats on getting them this time around! I absolutely want to make sandwich packs!!! (says the world's worst sewer ever) do you have a link to the directions? Wow you did such a great job. Really impressive! They both turned out so nicely. Great job! Letting the boys do handprints on the teepee would be so cute! I really enjoyed your old post about making the nativity scene. And it does look perfect to me, just from your pictures. It is adorable. I could never have even been able to do it! My mom was a big sewer, too. 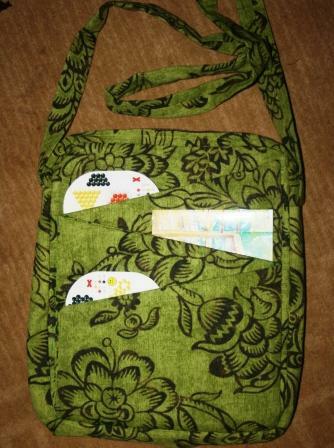 She even made purses from her own pattern, and fancy collars, and her own sundresses. I just get too frustrated and have to rip things out. In high school home ec we had to make a simple sleeveless shift. I made big holes all up and down the sides from having to rip out the seams so much. NOT my mother's daughter! I love the purse, it looks perfect!!! And the teepee! You really got your money's worth out of these lessons, especially if you can finally read patterns, too! YES to the handprints, then show us again!! Oh my God... I'm such a disaster at these things. Sewing, cooking, anything like that. I'm THE anti-housewife..
You sound just like me in regards to sewing. NOTHING can get me more agitated then trying to read those patterns. Good job on sticking it out...your projects are great! I took Home Ec in high school (1 yr). For our exam, we had to put a zipper in a dress that we made. I sewed the front and back of the dress together while trying to put in the zipper! But years later, I taught myself to sew. You're right: those patterns seem to be written in a foreign language. That tee-pee looks like fun! You should let the boys decorate it! I'm impressed with the teepee! I don't have much luck with sewing, but I'd love to learn! Good for you! I think its amazing when someone tries to learn something new and sticks with it!!!! What a great project! Your boys will have loads of fun in that T Pee! I cant sew. At all. I took a class in JR High, it was awful. My husband can totally sew though! Awesome! I want to sew. haha i KNOW you can do it!!! And getting had liquor is always good with some or after some sewing! Congratulations on your two projects. The purse doesn't even look like an easy pattern with all the pockets, zipper, and shoulder strap. The teepee looks great too. Hand prints would be great. Be sure to guide them so your hard work doesn't get ruined. It will become a real treasured piece between the fact that you made it and that their prints are on it. Sounds like you had fun though. I need to make some if this sandwich bags too. Seen so many cut ones! I have to say you did AMAZING for being a beginner. Both your projects turned out awesome! I am new to sewing and haven't even attempted reading a pattern yet. I had to learn how to sew in a straight line off of a blog tutorial. haha! Thanks for stopping by my blog and leaving such a sweet comment! The purse turned out really well! I guess you were able to sew through the many layers of fabric you mom didn't want to sew :). Well, that's a pretty ding dangety dongety fine looking tepee! My grandkids would really like that!